Hampi festival is one of the major tourist attractions of Karnataka. It features dance, drama and music against the backdrop of the rocks and ruins of an ancient empire. It takes place around late January. It is the best known dance festival held in February-March in Khajuraho. The cultural extravaganza takes place at an ampitheatre near of the Chitragupta Temple. Held against the backdrop of the imposing Sun temple, annually from February 19 to 23. The exquisite ‘Salamander’ or the ‘dancing hall’ of the Sun temple is an architectural wonder. The walls are covered with fine sculpture. The festival started in the year 1986 at Konark Natya Mandap, Arka Vihar, Konark. It was started by Guru Gangadhar Pradhan. In late December or early January, for 4 weeks danseuse enthrall against backdrop of the Pallava Rock Sculpture – ‘Arjuna’s Penance’ of this ancient temple town, which is an UNESCO World Heritage Site. It is a twice a year festival – held in October-November and March-April in the Nishagandhi Theatre, at the Kanakunnu palace compound in Thiruvananthapuram, Kerala. Dedicated to Lord Shiva, who is also the Lord of dance forms as the ‘Nataraj’, it begins on Mahashivratri at the 1000 year old temple in Chidambaram, Tamil Nadu. Taj Mahotsav is a 10 day extravaganza held between February and March. It features classical dances, folk art and music. The venue is Shilpgram, a stone throw from the majestic Taj Mahal in Agra. India is a land of festivals, fairs and celebrations. Most of these follow the crop cycle. Over time they have grown legends, most portraying the victory of good over evil. And all adding to the color and gaiety to life. Legend says Ballia was the capital of King Bali, who was vanquished by Lord Vishnu in his ‘Vamana’ incarnation. It was once situated in the confluence of river Ganga and Saryu. In more modern times Ballia was the birth place of the hero of First War of Indian Independence, Mangal Pandey. The city of Ballia is also believed to the birth place and workplace of Maharshi Bhrigu. Dadri is a village some 5 km from the town of Ballia in Uttar Pradesh. Every year on Kartik Poornima (October – November) it hosts one of the largest cattle fairs of the world, alongwith the Sonepur and Pushkar fair. There is a temple dedicated to Sage Bhrigu in Dadri. It is believed that this is where Dardar Muni, son of Sage Bhrigu, on the boon of Lord Brahma, undertook penance. The fair attracts about a million people. It is famous for trading in livestock. Children’s day was first celebrated worldwide in October, 1953, under the sponsorship of International Union for Child Welfare, Geneva. The idea of Universal Children’s Day was mooted by late Shri V.K. Krishna Menon and adopted by the United Nations General Assembly in 1954. Universally, Children’s Day is celebrated on 20th November. However in India it is celebrated on 14th November, because the date marks the birth anniversary of our beloved first Prime Minister – Pundit Jawaharlal Nehru or as children called him fondly ‘Chacha Nehru’. The birth of Chacha Nehru..
His great love for roses and children are well-known. He often compared the two, saying that children were like buds in a garden to be carefully and lovingly nurtured, as they are the future. He was ‘beloved’ of children who christened him ‘Chacha Nehru’. As atribute to his great love for children, his birthday is celebrated all over India as ‘CHILDREN’S DAY’. A national holiday, it is celebrated in schools and colleges with functions catering to children. Apart from his formidable skills as a statesman, Nehru was also immensely fond of children. Children to Nehru were little adults in the making. The story also goes that he started to wear a rose on his jacket after a child pinned one on it. The national children’s centre, Jawahar Bal Bhavan, is also named after him. Amidst all this pomp and celebration we should not lose sight of Chacha Nehru’s real message. Providing children with a safe and nurturing environment in which to flourish and develop to contribute to nation building. 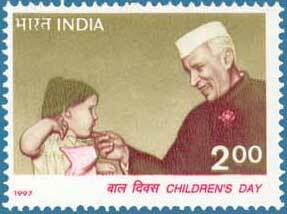 This day we renew our commitment to the welfare of children and teach them to live by Chacha Nehru’s example. Schools have cultural programmes with students running teh show. Schools celebrate this day by organising cultural programmes. Teachers of the school perform songs and dances for their students. Various competitions are organised. Television channels have got into the fray and air special programmes for kids. Chandigarh, a new city and lacking in some of the age-old cultural traditions, has acquired new ones and a few like the Chandigarh carnival and “Maha Moorkh Sammelan” are unique. Chandigarh carnival is a three day long gala, organized by the Chandigarh administration to promote creativity and talent of the citizens. It provides a platform to children and senior citizens, to come forward and exhibit their talent. Various competitions like painting and clay modeling etc. are conducted. Pick and drop facilities for senior citizens ensure greater participation. Many schools also come and take part in the carnival. Some of the major competitions held are clay modeling, painting, fancy dress, singing, sit-and -draw etc. The Carnival starts with a gala parade where colorfully dressed revelers set the tone. One of the biggest features of this festival is that it arranges for pick up and drop facilities for the senior citizens, so that they do not face any inconvenience. The 2009 edition comprised of 16 troupes from Jordan, Hungary and France showcasing their talent. Around 42 stalls were set up by NGOs to exhibit musical instruments, rare photographs, replicas of French architect Le Corbusier’s art works. The main entrance was in the shape of a guitar. Ganga Mahotsava is a 5-day festive event held on the banks of Ganges in Varanasi on the full moon day in the Hindu month of Kartik. Ganga Mahotsava tends to promote Varanasi and Ganga as the cultural capital and lifeline of India respectively. The event gives stress on the promotion of the classical style of Indian music & dance. It provides opportunity to viewers, to witness performance of the great exponents of Indian classical dance and music. Some of these exponents of art reside in Uttar Pradesh itself. In the past editions, laureates like Ustad Bismillah Khan, Pundit Chhanulal Misra, Girija Devi, Bal Murli Krishnan, Bhimsen Joshi, Birju Maharaj, Amjad Ali Khan, Vilayat Khan, Zila Khan, Sujat Khan and Zakir Hussein have given their enthralling performances in this festival. This festival is a must attend for every tourists the festival of lights at Varanasi. It is believed, on the day of Dev Deepavali God descends from Heaven to take a holy bath in the Ganges. 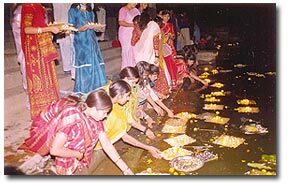 During the festival the banks of the river Ganga are lit with diyas or the earthen lamps and amidst chanting of Vedic hymns. The ghats of Ganga wear a majestic mystic look as thousands of pilgrim , tourists walk to take the holy dip in the wee hours of the holy day. Men and women bathes in the river while chanting mantras and doing surya namaskar or worshiping and bowing to the Sun God. Stay at Varanasi for 5 days : If you want a true taste of Varansai, you should consider staying in one of the many dharmshalas lining the ghats? For those who like their creature comforts, book a hotel well in advance to avoid last minute hassles. My recommendation would be : Enjoy a boat ride down the mighty Ganga River, taste the famous puris and kachoris for breakfast and finish it off with a Banarasi paan (Beetle), shop around for the hallmark Banarasi Sarees (India famous dressing attire) and also visit the ancient temples dotting the oldest city in the world. Dhanteras is the festival celebrated two days before Diwali. It usually falls on the auspicious thirteenth lunar day of Krishna Paksha in the Hindu month of Kartik (October/ November). On this day Goddess Laxmi is worshipped to provide prosperity and wealth. Dhan Teras holds great significance for the business community. According to legends once a sixteen year old son of King Hima was doomed to die by a snake-bite on the fourth day of his marriage as per his horoscope. On the particular fourth day of his marriage his young wife did not allow him to sleep, she laid all the ornaments gold and silver coins at the entrance of her husband’s boudoir and lightened innumerable lamps all over the place and herself went to sing songs. When Yama, the god of death arrived there in the guise of a serpent his eyes got blind by the dazzle of the brilliant lights and he could not enter the Prince’s chamber. So he climbed on the top of the head of the ornaments and coin and sat down. In the morning serpent quietly went away. Thus, the young wife saved her husband from the clutches of death. Since then this day of Dhanteras is celebrated that is also known as “Yamadeepdaan”. Then the lamps are kept burning throughout the night in reverential adoration to Yam, the god of death. Then this day of Dhanteras came to be known as the day of “Yamadeepdaan” and lamps are kept burning throughout the night in reverential adoration to Yam, the god of Death. 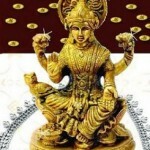 Dhanteras is also treated auspicious to purchase gold or silver articles or at least one or two new utensils. It is believed that if you bring new Dhan or some form of precious metal it is a sign or symbol of Good –Luck. If you feel, we have missed any information that is helpful for your friends visiting this blog, do post. We would be glad to receive your comments and conversation. Dev Uthani Ekadashi festival is celebrated in the month of Kartik (November-December).It is believed that on this day Lord Vishnu had woken up after a rest of four months. This day is considered auspicious as marriages take place on this day all over India. Beside this all auspicious work could be started from this day. 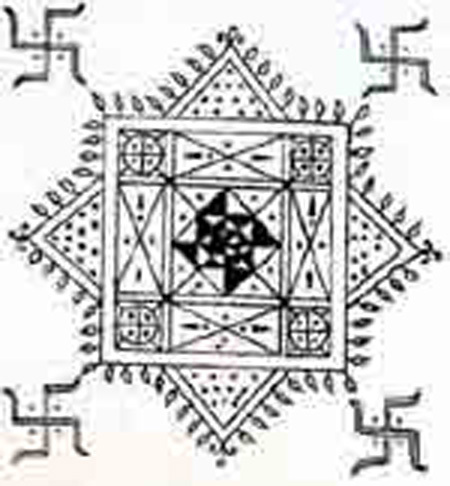 lt is also known by the name of Dev Pradodini Ekadasi, Hari Prabodini Ekadasi, Uttahana Ekadasi and Bada Ekadasi. On this day, an image of Lord Vishnu is drawn on the ground. Lamps are lit around it and fruits and vegetables are offered to this fresh image. In some regions this image is covered with a big brass plate symbolizing that lord is sleeping. Bhajans are dedicated to lord Vishnu to shed his sleep and wake up and bless people. To wake the Lord, children light mustard torches at night and make lot of noise. The courtyard or the room should be cleaned and with limestone or chuna and with geru the image of Dev or the deity or the Lord should be drawn. In the evening, puja is done with water, roli, moli which are the colored thread, rice, fruits, gut, cotton, banana, gwar ki phalli, mooli, money etc. The Deepak or diya or the home made soil lamps are then lit and devotional songs are sung. The most important part of the puja. People perform Tulsiji ka Vivah on this day with Shaligram. Chhath, also known as Dala Chhath is an important festival celebrated in Bihar and many other parts of India in which setting Sun (dawn) is worshiped . Although Bihar celebrates Chhath most elaborately it is also followed in some parts of West Bengal, Jharkhand, Orissa, Assam, Mauritius, mainly among the Bhojpuri and Maithali speaking people. Chhath is also important for Nepalese worshippers of god as well as in eastern Uttar Pradesh. The best place to witness Chhath would be around Northern Bihar where it is celebrated in great grandeur. The festival is observed and in Bihar since time immemorial with the constant faith that the Sun God fulfils wishes if ‘araghya’ is offered with complete dedication and devotion. Chhath is not just a physical attachment to the people of Bihar, it is also present in their hearts, and this is why the people bring wherever they have migrated. Nowadays it can be easily seen at the ghats of Yamuna in Delhi and other parts of India indicating its presence across the country. It is a festival connected with purity, devotion to the Sun God who is considered as the source of life on this earth and is regarded as wish fulfiller. Rajgir: 15 km. The ancient capital of Magadhan empire which flourished in the 6th century BC. Gaya: 95 km. It is a very sacred pilgrim center for the Hindus. Bodhgaya: 110 km. It is the holiest amongst holy places of Buddhist World., where Prince Sidharaha attained the supreme enlightenment and became the Buddha , the enlightened one. Pawapuri: 25km. A sinless city it is a great pilgrimage center of the Jains. Lord Mahavira, the greatest propounder of Jainism had delivered his last sermon took Mahaparinirvana and was cremated here. The Chandrabhaga fair is one of the most popular festivals celebrated at Jhalrapatan in Jhalawar district of Rajasthan, India, in the month of Kartik, Oct-Nov. This festival is celebrated in the honor of the sun God. According to legend’s Lord Sri Krishna’s son Shambhu who was suffered from Leprosy was cured by the Sun god. From that time period this fair is celebrated in honor of the God sun. Devotees from various parts of India congregate here, take a dip in the holy waters and offers prayers to the Sun. Every year in this Chandrabhaga Fair a huge cattle fair is organized where farm animals like horses, cows, camels and bullocks are bought here from the distant parts for sale. This fair gives good opportunity to the tourists to know more about the traditions and rituals of this region. The fair gives a very good opportunity to the tourists to know more about the rituals, traditions and also about the people of this region. Ramganj Mandi is the nearest Railway Station(25kms). Jhalawar is well connected to Kota, Bundi and Jaipur. National Highway No.12 passes through Jhalawar. Buses are available from all major cities. Bundi one of the most attractive, beautiful locations in the Hadoti district Rajasthan comes alive during the Bundi Utsav held in the month of November every year. Bundi Utsav is a spectacular culmination of traditional art, culture and craftsmanship which surprises every visitor with its grandeur. Music, Dance, sports, sightseeing, competitions and many other events organized by the Rajasthan State Tourism Department are not only engaging but also present the scale of Indian Culture and traditions in front of Foreign tourists. The people visiting the place during this Festival held in the month of Kartik are totally captivated with the scenic and natural beauty. Held in the month of Kartik, there are a number of religious and traditional customs associated with the celebration of Bundi Festival. “Keshorai Patan” a small township near Bundi is sometimes referred as “Mini Pushkar” especially on the full moon night of kartik. Bundi is one of the most picturesque locations of the hadoti district in Rajasthan. It is quite popular that the palaces and forts of Bundi have a fairy tale feel about them. The town is quite isolated from the maddening rush and crowd of adjoining cities and thus at times appears like a beautiful frozen painting. The town is surrounded by rock gorges and the adjoining river Chambal provides a perfect location for water activities. The zone with the lush green widespread jungles, the vast stretches of forests and wildlife, the sprawling rocks and ravines makes it a paradise for adventure lovers. Bundi till date claims to be the house of World’s best paintings and their origins. Especially the paintings at Chitrashala are known across the world. Rajput architecture and feel is still felt in its palaces as in the Bundi Palace.